Valentina Shevchenko defeated former champion Holly Holm on Saturday, further throwing the UFC Women’s Bantamweight division into disarray. Seventh ranked Valentina Shevchenko stunned former Women’s Bantamweight Champion Holly Holm in the main event of UFC on FOX on Saturday night. Her unanimous decision victory not only puts her on the short list for a title shot, but it also finishes skewering the comfortable hierarchy the division has held since November. In the time since Holm shocked the world with her head-kick KO of Ronda Rousey, the title has changed hands twice. Holm lost the belt to number one contender Miesha Tate in March. Tate most recently lost the belt at UFC 200 to fifth ranked Amanda Nunes earlier this month. In the eyes of many, the division had to sort out the Big Three of Rousey-Holm-Tate to determine who was the best in the world at bantamweight. Instead, Amanda Nunes and Valentina Shevchenko have turned the division on its head in dispatching the biggest active names at 135. The most obvious effect this has on the division is that its premiere stars are now removed for the title picture for the immediate future. In their absence, the new champion and challengers have ground to cover before they gain the same level of recognition as their peers. This is not to say that the Nunes and Shevchenko are not elite competition. Simply, they have yet to reach the level of household name recognition that Rousey and Holm have. In terms of marketability, the Nunes and Shevchenko aren’t pay per view marquee names yet. Such is the division in which the belt has changed hands so frequently in twelve months. 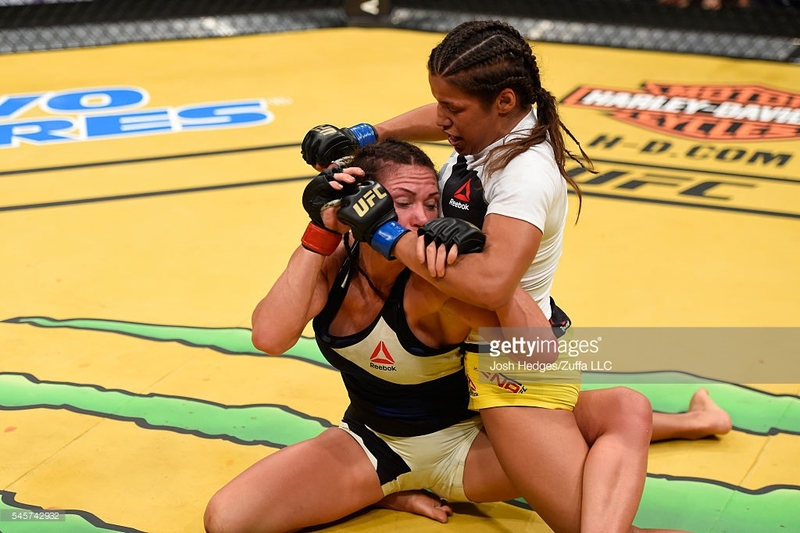 Julianna Peña grapples with Cat Zingano at UFC 200. Now, the next contender in line has yet to be determined. Conventional wisdom would say that it is fourth ranked Julianna Peña. A winner of The Ultimate Fighter, Peña defeated former title challenger Cat Zingano at UFC 200 earlier this month. Another option now is obviously Shevchenko whom lost a close decision to Nunes in March. With the division in disarray, “Bullet” is now riding a strong wave of momentum to make a case for a title shot. If Peña is not next in line for the title, a fight with Shevchenko in an eliminator makes the most sense. Former champion Miesha Tate is also not far removed from her own tear through the division. She remains on the short list to fight for the belt, and a fight against her former TUF protégée is one match-up that could be very intriguing. Now to the elephant in the room, when is Ronda Rousey expected to return? Her initial injury layoff and film commitments have kept her out of the cage for most of 2016 already. While she was originally set to return around November, a knee procedure has pushed her expected comeback to early 2017. UFC President Dana White has stated repeatedly that when Rousey returns to competition, she will be fighting for the title. For Nunes, waiting for Rousey could obviously be very lucrative. Having already fought twice in 2016, it’s completely reasonable that Nunes could hold off for a December or January match if that is when Rousey is ready. That is all under the assumption that Rousey does return in that timeframe. Rousey’s extended media silence has many wondering about the state of the former champion when she returns. At 29, Rousey has transcended MMA to achieve mainstream popularity. A triumphant return would be a great story for the world of sports. But, like Gina Carano before her, a complete departure from fighting for a movie career remains an option. One thing is for certain, the 135 division is dramatically different than from when she left it. The list of contenders is long, and whomever holds the title will have to go on a very remarkable run if they wish to keep the belt for an extended amount of time.